Upper East Side Shopping is perhaps a little less obvious than shopping on Fifth Avenue. However, you should certainly check out this neighbourhood! The Upper East Side is the part of Manhattan between 59th and 96th Street, on the east side of Central Park covering around 5 kilometres. The area is known for being very chique; right across from Central Park, on Fifth Avenue, you can marvel at the brownstone houses. This is also called the ‘Museum Mile’ because of the many museums located here such as the Guggenheim Museum and the Metropolitan Museum. 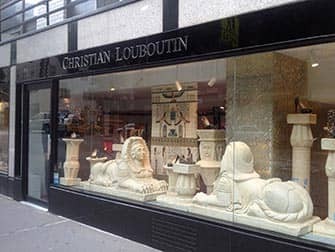 You can very easily combine a visit to the museum with shopping in the Upper East Side. Even a peaceful morning in Central Park could be complemented with an afternoon of shopping as there is something for everyone. 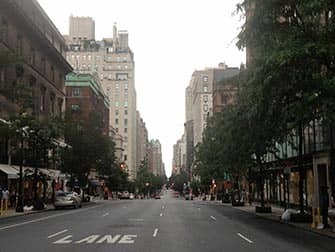 Unlike the famous Fifth Avenue shopping area (the part just below the Upper East Side), this is a quiet neighbourhood, visited less by tourists, even though it has the same shops. Here too you’ll find brands such as Victoria’s Secret, Aldo and Sephora. These are mostly located on Lexington Avenue, around 62nd Street and below. 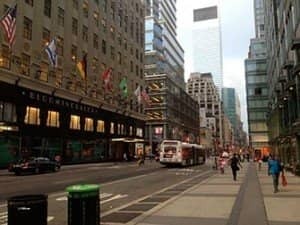 You can find the well-known department store Bloomingdale’s on 59th Street between 3rd and Lexington. 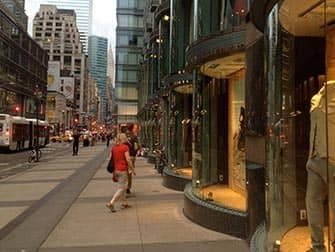 Those with a little more to spend or those who just want to enjoy the luxurious feeling of the neighbourhood should head to Madison Avenue. 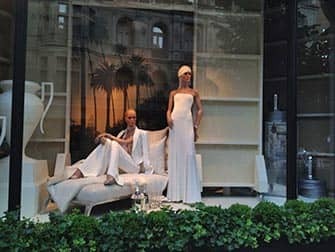 Here you’ll find the most expensive designers in beautiful buildings and with breathtaking store windows. Lanvin, Oscar de la Renta, Christian Louboutin, Dolce & Gabbana… Each and every one is a feast for the eyes. 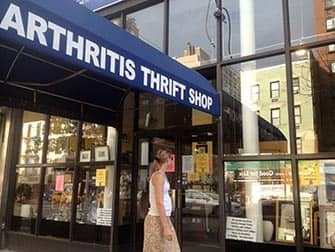 Of course, to have a true New York experience you’ll have to go thrift shopping; this neighbourhood is known for its many thrift shops, or charity shops, mostly found from 80th Street onwards between 2nd & 3rd Avenue. Thrift shopping has become a real craze and the great thing about thrift shops is that a lot of the proceeds goes to charities, foundations and organizations. 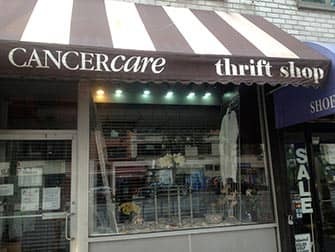 You can find great things at the ‘Arthritis Thrift Shop’ (3rd & 81st St.) or support the ‘Cancer Care Thrift Shop’ (3rd & 82nd St.). The shops might not seem very appealing, but it really does pay to have a look around; these are the places where you’ll find Chanel coats, Prada dresses and Jimmy Choo’s! 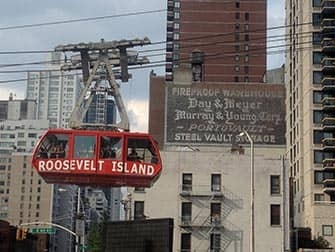 Taking the Roosevelt Island Tramway from the Upper East Side to Roosevelt Island is a great way to enjoy the Manhattan skyline. You can find it on 2nd Avenue around 60th Street, it leaves every 15 minutes between 6am and 2am (and until 3:30 in the weekend). Visit the new Four Freedoms Park, dedicated to President Roosevelt and his famous Four Freedoms Speech of 1941. Open everyday from 09:00 until 17:00, closed on Tuesdays.